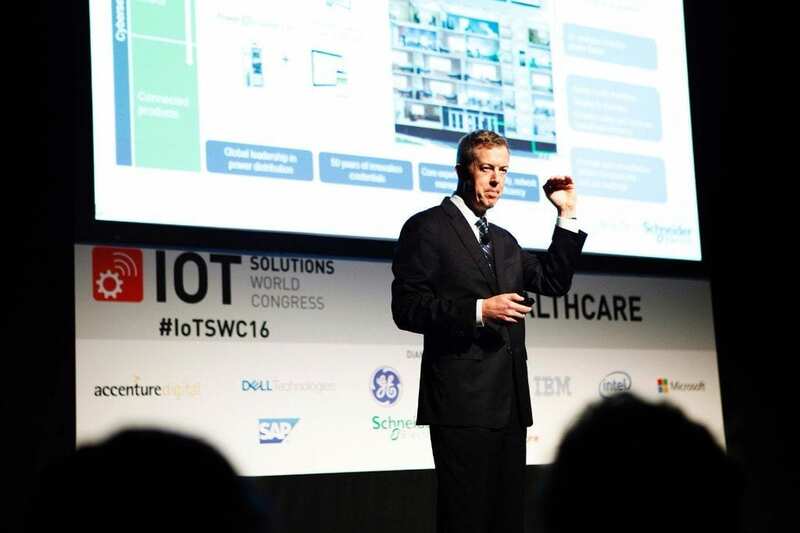 Schneider Electric participated in the IoT World Congress in Barcelona, Spain recently. The 3-day program featured today’s most influential IoT thought leaders, and our very own Healthcare Solutions Vice President, Michael Sullivan, was one of them. Michael’s presentation focused on improving hospital support systems and facility efficiency with IoT. After discussing some of the key healthcare challenges, such as the need to improve operational efficiency, patient satisfaction, and hospital safety, Michael went on to discuss emerging and upcoming IoT trends and predictions. Did you know that by 2020, there will be BILLIONS of sensors in buildings, including hospitals, that are connected to the internet? This continuous data feed will provide new ways to understand and improve everything from patient health to power reliability. Schneider Electric’s healthcare solutions are built on the premise of “innovation at every level” and helping hospitals thrive through the use of smart, connected products like smart panels, real-time location devices, mobile apps, and many more. We then aggregate the data from these products into our edge control software systems that provide intelligent power and building management. Data coming from all these connected products can then be extended to services such as predictive maintenance, asset performance management, weather prediction, and sustainability planning. Schneider Electric has extensive experience in bringing this innovation to our healthcare customers around the world. In Massachusetts, we helped a nationally recognized research laboratory identify and solve several major problems in their ventilation system using our Building Analytics service, resulting in over $286,000 in annual savings. At Moorfields Eye Hospital in London, we used StruxureWare for Healthcare to help bring their aging facilities into the modern area, and improve operating theater uptime as well patient flow. And at a children’s hospital in Australia, we are providing a complete digital hospital infrastructure solution that includes intelligent building and power management, security, noise monitoring, and IT/OT integration with the enterprise service bus. Download Michael Sullivan’s full presentation, “Improving Hospital Support Systems and Facility Efficiency with IoT” for more Healthcare IoT stories like these and details on how we deliver the right information to the right people, anytime, anywhere. Want to learn more about how we create innovation at every level in hospitals? Watch this video! Michael Sullivan should come and speak at our “Holistic I o T in the Health Eco-system” Conf. at our destination pavilion at the Intelligent Health pavilion @ HIMSS 2017 where we are connecting over 30 sponsors in the Smart Hospital and our connected i-Home ™. Join, Thoughtwire, Avnet, IBM, and Microsoft at our pavilion. Thank you for your comment and invitation Harry. I’ll reach out to you privately to discuss in more detail. Excellent post. Hospitals will definitely benefit from making use of IoT in their systems and facilities. Simple Ways to Improve Hospital Efficiency – 3 Tips for Hospital Facility Managers Moorfields Eye Hospital: Improving Facility Visibility with EcoStruxure™ for Healthcare Is energy efficiency the key to hospital financial health? What’s the Big Deal with Hospital Big Data?